Experience the thrill of a 2019 Toyota Camry sedan today, head to our new and used dealership in Sedalia, Missouri near Clinton for a test drive! Here at McCarthy Toyota of Sedalia, we offer personalized auto shopping experiences so that customers looking to end their search for a new car can snag the Camry trim that complements them with ease. Spend less time researching sedan models and more time enjoying your purchase, get in touch with our Toyota dealer! We'll accompany you on a test drive so you can see the Dynamic Radar Cruise Control, Intelligent Clearance Sonar and Bird's Eye View Camera in action. 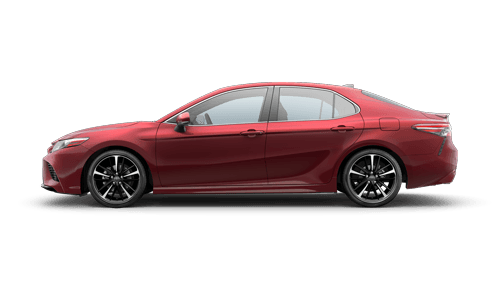 The McCarthy Toyota of Sedalia team member assisting you will also go over the ToyotaCare maintenance and roadside assistance plan that comes included with your new 2019 Camry purchase, so what are you waiting for, schedule your Toyota test drive now! Enjoy a vehicle that can be equipped with a 3-mode drive switch and a 3.5-liter V6 engine that utilizes a direct-injection system, finance a 2019 Toyota Camry at McCarthy Toyota of Sedalia near Boonville, MO today! Our new and used car dealership offers comprehensive financing assistance to drivers of all credit scores, so if you're interested in learning more about the Camry loan packages that are available to you, submit a credit application to our team via our secure website now. One of our Toyota finance department staff members will get in touch with you promptly. Our dealership also offers vehicle appraisal services, so don't hesitate to end your search for new cars for sale near Marshall, Missouri, trade in and up to a Toyota Camry at McCarthy Toyota of Sedalia today!